The flora of forest floors in South Eastern Jutland is many places rich and varied especially where the soil has some lime. 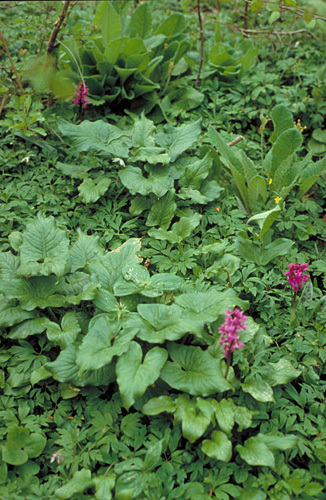 Such a flora can be seen in the right picture with species as Anemone hepatica, Paris quadrifolia, Anemone nemorosa, Listera ovata and Orchis mascula. Also the southern species Primula elatior and Arum alpinum ssp. danicum can be seen. 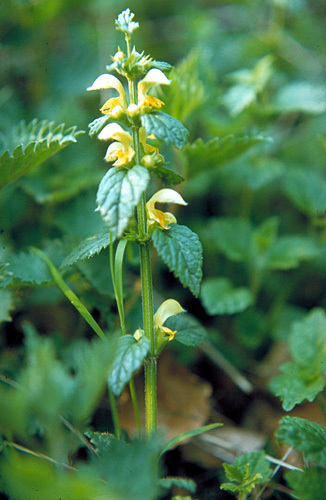 The picture below shows Lamium galeobdolon with europaean northern distribution limit through Jutland. It can be found in most of the forests in the southern parts of Eastern Jutland. A larger form - Lamium galeobdolon ssp. argentatum - is cultivated in gardens and can be seen naturalized in many forests especially near the roads. Common species of the flora on rich mull in Eastern Jutland are Corydalis intermedia, Anemone ranunculoides, Adoxa moschatellina, Ficaria verna, Ranunculus auricomus, Stellaria holostea, Pulmonaria obscura, Viola reichenbeckiana, Viola riviniana, Asperula odorata, Mycelis muralis, Lapsana communis, Geum urbanum, Geranium robertianum, Stachys sylvatica, Veronica montana, Convallaria majalis, Polygonatum multiflorum, Phyteuma spicatum, Carex sylvatica, Carex remota and the grasses Millium effusum, Melica uniflora, Poa nemoralis, Festuca gigantea and Hordelymus europaeus. On slopes where the lime has been washed out and the soil is slightly acid common species are Majanthemum bifolium, Luzula pilosa, Veronica officinalis, Oxalis acetosella, Carex pilulifera and the grasses Deschampsia flexuosa and Festuca ovina. In the southermost parts of Eastern Jutland several warm demanding forest plants become rather frequent such as Carex strigosa, Ranunculus lanuginosus, Festuca sylvatica and Dentaria bulbifera. Rare species as Matteuccia struthiopteris, Taxus baccata, Carex pendula and Lunaria rediviva can also be found here, but it is rather due to the humid, mild climate near the sea. 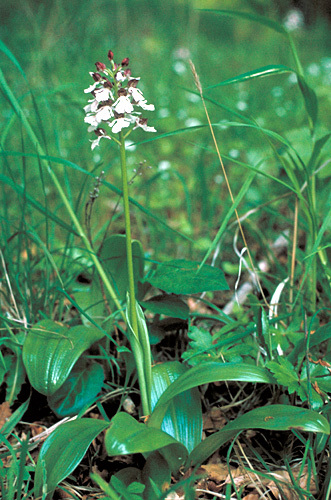 Several species of orchids can be found in the eastern Jutland forests near the coast. Most common is Epipactis helleborine, but closely connected to the plastic clay the rare Epipactis purpurata can be seen. The latter has only a few sites outside Eastern Jutland. Other quite frequent orchids are Orchis mascula, Listera ovata, Neottia nidus-avis and Platanthera chlorantha. More infrequent are Dactylorhiza maculata ssp. fuchsii and Epipactis phyllanthes and in a few places one can find Orchis purpurea (the right picture), Plathanthera bifolia ssp. latiflora and Cephalanthera longifolia. Back to The fjords and coast of South Eastern Jutland.